Salim Buang is in his 60s and turned his hobby into a small business after getting retrenched during the 2008 economic crisis. His shop feels like a treasure trove of wooden crafts, jewellery, and collectable items that he has individually and carefully selected over the years. Salim started his business with a folding table that he placed in the corridor outside a row of HDB (brick-and-mortar) shops. This way, he got to know the regular stream of passerbys in the community. In the beginning, he kept his costs to a minimum to test the market. In each phase, he waited patiently till he had accumulated enough capital, established his customer channels, and gained confidence in predicting demand before investing in further expansion. While his business remains “micro”—he runs it all by himself—he took the business through incremental phases of growth without any external capital injections from formal institutions such as banks and government agencies. His approach: slowly investing his profits back into himself. This model has a downside: it limits the speed of growth. However, it keeps the business at a manageable, sustainable size to handle on his own. Apart from precious antiques that sell once in a way, Salim also sells items with fast sales cycles such as arm socks for truck drivers, simple broaches for women, and pyjamas for children. These everyday necessities balance his everyday cash flow. He constantly revises his inventory to ensure a trickle of revenue from low-value items that he places in prominent places, while relying on better times in people’s paycheck to sell his expensive collector items. “Luckily, I had written down the serial numbers of the old currency notes, so I immediately called my friends in the same trade and told them about it— that’s how the thieves got caught: they were trying to resell the stolen goods to these other shops! 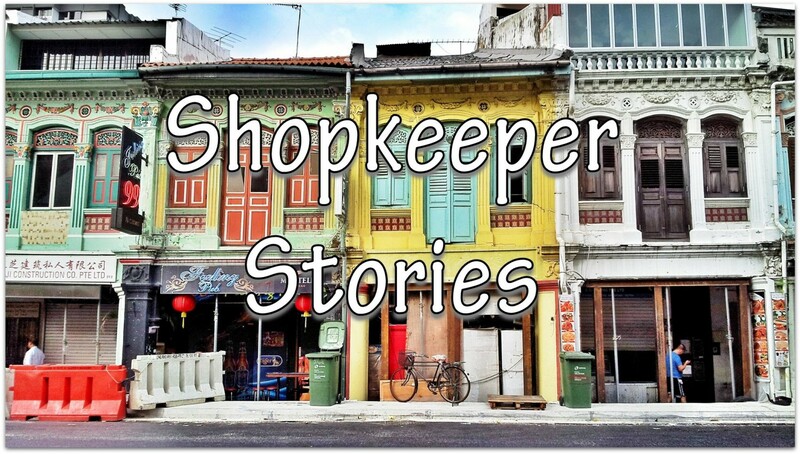 Shopkeeper Stories is a photographic documentary of small business owners with their trades around the world, sharing their views on business and life. You can catch all the posts on Facebook and Instagram @ShopkeeperStories. Enjoy! This entry was posted in Art & Craft, Clothes, Singapore and tagged business growth, business tips, collectibles, growing old, jewellery, microenterprise, risk, small business. Bookmark the permalink.